For one-off parts, there is a lot to be said for cutting by hand which, unlike most other methods, requires almost no setup time. The tools for the job are the piercing saw and saw table. The piercing saw takes, guess what? piercing saw blades, which are clamped in place. A useful feature is an adjustable frame to accept blades of different lengths. 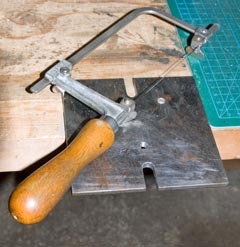 When inserting a blade, clamp it at one end, lean on the frame slightly to compress it, and clamp the other end. Then release the frame to put the blade in tension. Just enough tension is required to keep the blade fairly straight during normal cutting. Excessive tension is only likely to cause the blade to break. Blades are available from tool suppliers, but there is a range of qualities. Poor quality blades appear to be stamped out, the tooth form is erratic, and individual blades are often difficult to separate when they are all together (they usually come in tens, wound with very fine wire). Often they do not cut straight, and break easily. Good quality blades are visibly better formed, are separate, retain their sharpness, and last much longer. Blades come in a range of sizes from no. 8 (the largest) through 0 to no. 6/0 (the smallest). It is not always easy to find out the actual sizes, so I have added a list here. In selecting blades, the teeth/cm is the most important dimension. One should aim to use a blade that has at least three teeth in contact with the material at any time. A moment's thought will tell you that rule will not work in a lot of cases. The smallest blade has 30 teeth/cm, or 3 teeth/mm, which means that the blade is theoretically too coarse for any material thinner than 1 mm. And I regularly work with 0.25 mm sheet. Fortunately, the rule is not hard-and-fast, and with a little care, thinner materials can be cut. I routinely cut 0.25 mm nickel silver and brass sheet with a 6/0 blade. These materials are soft enough to cope with it. It is even possible to cut sheet half that thickness, by setting the blade at an acute angle to the sheet rather than nearly vertical. That only works for straight cuts, but it is doable. To cut, hold the blade vertical, or nearly so (a slight forward lean is acceptable), and start with an upstroke to make a little notch in the material. You should be able to follow that immediately with a downstroke and continue cutting. If the blade snags and will not come down, repeat the upstroke until it does. To start, locate the blade against your thumbnail. The rest is practice. Apply just enough pressure to keep cutting, excessive pressure simply leads to breakages. It is possible to turn corners of very small radius, providing you keep the blade truly vertical and let the blade do the cutting. As with any cutting operation, lubrication helps. I use candle wax, and keep handy a stub of candle to wipe on the blade when necessary. You will be amazed how much easier cutting becomes the first time you try it. The saw table is a piece of mild steel, thick enough to be rigid (mine is about 8 mm) with a slot where the cutting actually occurs. The slot can be fairly narrow so that the sheet metal being cut is well supported. The table is firmly secured to the bench top. The table and the fixing should be as rigid as possible. Any vibration makes it harder to control the blade and makes a breakage more likely.